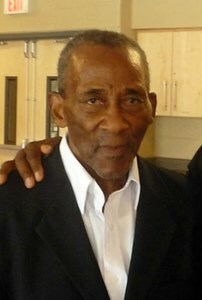 Harry "Trini" Bailey, 94, of Orlando, Florida passed away on February 4, 2019. Harry was born on February 8, 1924 in Freeport, Trinidad. He is preceded death by his parents, Solomon Bailey and Bertha Bishop; his son, Wayne Bailey; his siblings Henrietta Samuel, Sybil Smith, Francis Bishop, Donald Bailey, and Beauty Bailey. Harry is survived by his children, Harris Bailey, Angela (Keith) Geofroy, and Trevor Bailey; his brother, Joseph (Gloria) Bishop; his sister-in-law, Jasmine Bishop; his grandchildren, Terry Bailey, Monique Paul, Kareem Bailey, Aaisha Crichlow, Kimberly Geofroy-Clary, Kevin Geofroy, Jill Sturge, Andrea Bailey, Cassandra Bailey, Christopher Bailey, Rodney Bailey, Delana Bailey Superville, and Holston Bailey; and nine great-grandchildren. In lieu of flowers, donations can be made in Harry's name to the Triumphant Living Inc. church in Oviedo, Florida. A visitation will be held at Newcomer Funeral Home located at 895 S. Goldenrod Road on Friday, February 8, 2019 from 5:00pm to 9:00pm. A funeral service will be on February 9, 2019 at 1:00pm at Triumphant Living Inc. in Oviedo. Add your memories to the guest book of Harry Bailey.